Based on our experience of manufacturing solar cell columns since 2009, Priess has developed a control system that is configured to meet future requirements and provides functions to meet all the needs of our customers—now and in the future. We call it the Priess LCC (Light Column Controller). Further Priess solar columns provide many options to build in Smart City Concepts such as WIFI, cameras, CCTV, loudspeakers, EV charging and more. Priess LCC is of modular design, which enables it to be adapted to individual types of columns, luminaires and batteries. The modular design of the control system makes it very flexible and it can be reconfigured if needs change in future installations. The control system is made up of a motherboard on which up to four sub-modules can be mounted. A typical configuration would be a motherboard with a charging module and an LED driver. 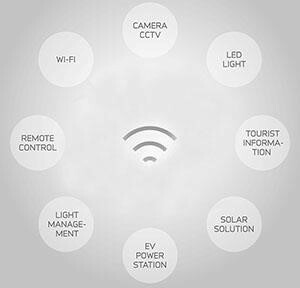 The control system manages the recharging of energy using the latest technology by means of Maximum Power Point Tracking (MPPT). This means that the charger finds the ideal working point for “harvesting” the solar panel’s energy. The LED driver supplies the luminaire with power, and the motherboard’s microprocessor controls all functions and protects the battery. It is possible to connect movement sensors to the control system to exploit the energy in the best possible way. All Priess LCCs can be remote-controlled if you have access to a WiFi hotspot. This makes it possible to set up a new lighting profile in the columns, keep track of the charging process and the energy consumed, as well as check the current battery level. The control system’s set-up is easy and intuitive to modify from any new Android smartphone with built-in NFC technology.